Recently Apple announced iCloud, a service that backs up data from your iOS devices into a cloud, allowing you to access that data on the go. What if you could back up your whole computer to a cloud? That’s what the folks at Dolly Drive are attempting to do with their cloud service. Made for Apple computers, it essentially takes Apple’s TimeMachine to the cloud, giving you access to your important data while you’re out and about, and allowing you to backup data in a cloud where it is not susceptible to damage or theft like a traditional hard drive backup might be. Dolly Drive gave me a trial account for the past few weeks to give the service a test drive. My account was only 10GB which is hardly enough space to backup my entire hard drive, but it did give me the opportunity to sync some of my important files to the cloud like pictures, documents, and music. Pricing Dolly Drive offers a pretty substantial amount of options when it comes to pricing. The cheapest plan is $5 a month, and gets you 50GB of cloud storage plus an additional 5GB of storage for free each month you stick with the service. If you’ve got a ton of data to backup, plans go up to 2TB of storage, with a price tag of $55 a month. All of Dolly Drive’s plans add 5GB each month for free, so if you buy what you need now, in theory the service will also grow along with you as you get more stuff you need to back up. Setup Setting up an account with DollyDrive was super simple. 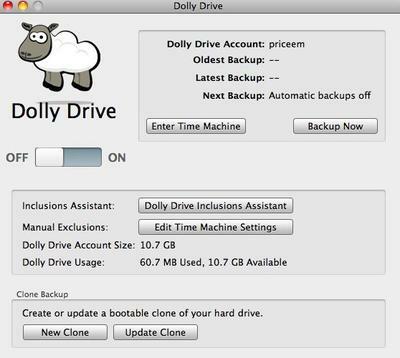 Once you download the Dolly Drive software to your Mac, the service offers you prompts to help you set it up to work along with Time Machine on your Mac. After that initial setup, you can have the service auto backup your computer (or certain files) whenever you want. For instance, I set my documents folder to backup from my MacBook Air hourly. That way, in theory, if I was to spend the day working on something and then accidentally delete the whole thing, I can go back and retrieve it on my Dolly Drive. The whole process is “set it and forget it,” once I set the backup to happen I didn’t have to think about what or when I wanted the computer to do it in the future. Backups of course require an internet connection, so there were a few times I wasn’t connected to the web and it tried to backup. Hard Backup In addition to backing your information up to the cloud, Dolly Drive also offers the option to create a bootable clone of your computer. Creating the clone is as simple as connecting an external drive to your computer and then pressing a button to create a new clone or update your current version. Authentication encryption. User name and password are encrypted. Data transmission over secure tunnel. When your data travels from your computer through a virtual “tunnel” to Dolly Drive, we ensure that even if someone sees the tunnel they will not be able to pick up your information because the data will be scrambled. Data storage at Dolly Drive data centers. Encapsulated in virtual storage technology, the data is not accessible by our technicians without direct authorization by the data owner (the subscriber). And when access is granted, we cannot just click on the data and see it – the process is multi-leveled and complex. Overall Thoughts Overall I think Dolly Drive is an awesome backup solution. Everyone knows backing up your hard drive is important, but not everyone necessarily remembers to do it (especially me). I really like that Dolly Drive backs up my information whenever I connect to the web, and that it is backed up in a cloud rather than on a physical hard drive. That means what I write at Starbucks will be backed up even if I roll over my computer with my car in the parking lot. The cloud backup allows me to take those backed up file with me everywhere, which is a huge plus. Dolly Drive’s cloning option lets you create a hard copy of your files as well (in case the service or your web ever goes down) allowing you to cover all your bases with a single service.